Why purchase a custom made knife? Each material is hand picked for its designed task. Every hand made blade has its own character and there will only ever be one like it in the entire world! 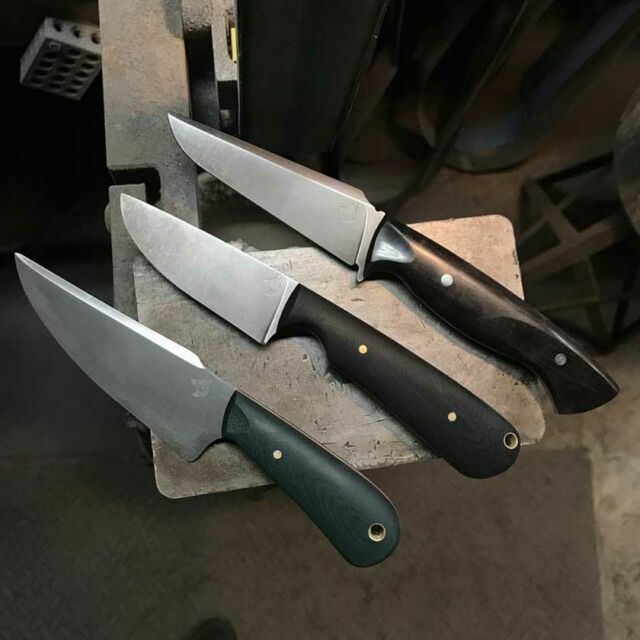 Each knife’s service expectations are weighed intently by the blade-smith, then the blade materials are chosen from the highest quality American made steels available. Utilitarian tools are a definite focal point for Doberman Forge. Tools are there to improve our lives, and a well-crafted kitchen knife does just that! A well-balanced chef knife that has a razor sharp, easily serviceable edge makes food prep fun again and efficient! Outdoor knives are a staple in the life of a Service member, Hunter, or outdoors-man! Whether you are using it as a camp knife, whittling, hacking brush, or skinning wild game… a quality made blade makes the world of difference. High quality blades can last life times when maintained. Doberman Forge is named for an amazing, late family pet, a courageous guard dog as well as a beloved family companion, stereotyped as highly aggressive and viscous, a formidable guardian. Akin to the strengths of the Doberman breed, we strive to pound the same qualities into our blades: Elegance (design), intelligence (making process), attentiveness (attention to detail), loyalty (everlasting). A friend for life, a one-of-a-kind knife! 13 Nov: New models ready for orders!